A former military officer and a foreign affairs official were sentenced to death and another foreign affairs official was sentenced to long-term imprisonment on Thursday in a special court of the Rangoon Northern District held in Insein Prison, according to Insein prison sources. Win Naing Kyaw, a former personal staff officer assigned to the State Peace and Development Council’s Secretary-2, the late Lt-Gen Tin Oo, was sentenced to death under the State Emergency Act III for leaking military secrets to the exiled media. Win Naing Kyaw also received a 20-year sentence for violation of the Electronic Act and holding illegal foreign currency. The Electronic Act prohibits sending information, photos or video damaging to the regime abroad via the Internet. Thura Kyaw, aka Aung Aung, of the ministry of foreign affairs office was also sentenced to death under the state emergency act. Pyan Sein of the Ministry of Foreign Affairs received a 15-year sentence for violation of the Electronic Act. The three were arrested after information and photos about Gen Shwe Mann's trip to North Korea were leaked to exiled news media last year. The trip involved procuring military arms, tunnel building and other matters. Dozens of officials in the Ministry of Defense and Ministry of Foreign Affairs, including Col Kyaw Kyaw Win, who was director general of the State Peace and Development Council, were also arrested, military sources said. The status of their cases is not known. After the information leak, the junta made a significant reshuffle at the Ministry of Foreign Affairs that affected more than 70 positions, including two directors, four deputy directors and eight assistant directors. It is not known if the reshuffle was directly a result of the information leak. Yin Yin Oo, a sister of former deputy minister Kyaw Thu, who was the director of the ministry's influential political department, was transferred to Saudi Arabia to a counselor post. It could have been done by Shwe Mann, Kim Myaung Il, Than Shwe or their family members. Who knows? But to cover up the leak, some one has to pay the price in this particular incident. That is sad. "It was very sad for these three. I hope their bravevy and strength ..."IF THEY WERE THAT BRAVE AND have moral conviction, they would have left government services many moons ago. Like the ambassador who applied for political asylum in the US, their motives are suspect. Why did they not flee to Thailand to join those who have moral conviction, although their methods may be wrong. AS FOR Why are Human Rights Watch, Amnesty International, Burma Campaign UK/US,NLD, and other opposition groups so quiet about this impending execution? Why have they not condemned this execution? None of THEIR BUSINESS;THEY ALSO HAVE OFFICIAL SECRET ACT. "They are not denouncing the fact that two brave SPDC officials who are willing to give up their lives to expose their masters' crimes. Opposition groups have to work together and support brave SPDC officials like those two who want ...." Naive. CAN ANYONE TRUST A TRAITOR? Your enemy's enemy is not necessarily your friend in multilateral conflict. It is devastating for me to read this terrible news, especially, the fate that awaits U Win Naing Kyaw. I know him personally. I address him Ko Win Naing Kyaw. I have no idea what he has done, but personally, I think he is a nice bloke, generally a kind person, humorous and know a lot of inner workings, personalities of the Burmese military machine. He was once one of the very few who is allowed to carry a firearm near Than Shwe. Personally, I believe no one deserves capital punishment. Think of grief, hardship & long-suffering of the loves ones’ that is going to be left behind. To me, it looks like evil Than Shwe, is killing him as an example, considering Khin Nyunt, or any other for that matter, was not given death sentence. I am about to eat dinner when I read the news. 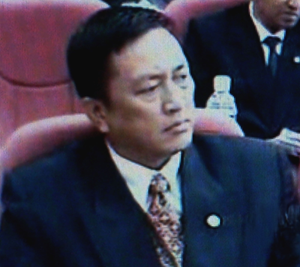 Now I am thinking how Ko Win Naing Kyaw is, has he had his dinner? What would he be thinking right now. How’s his wife, whom I’ve met once, very briefly. I request anyone reading this to pray for him. Thank you. 't you speak up against the injustices? You are abetting in the crime. I had received a reply from a leading British MP to my enquiry about the role UK could play in Democracy struggle in Military ruled Burma. She pointed out the every avenues possible to support the democracy movements in Burma had been exhausted by current Labour government. They could only give lip service to Gandhi-styled resistance in Burma. It will never work in dealing with Murderer Than Shwe. UK/ USA and EU should set up the military training centres for Burmese people the same way as they are now doing in Iraq and Afghanistan. This patriotic forces can march to Rangoon and cornered discarded Than Shwe in rat hole of Pyinmanar. Armed Resistance is the only language Dictators understand. I paid my full respect to patriot WN Kyaw, A Aung and Pyan Sein. They attain the status of assassinated 1st cabinet of Burma. MARTYRS. Capt Ohn Kyaw Myint also attain the martyr status. Don't let fall this shameful sentence in the silence. Every brief of freedom and justice must be supported from the whole country, everywhere it's coming.The unbroken side of the country must find unity against the barbarian power. Law of the Jungle has bitten almost every innocents in Burma. Now it is the time for junta's own flesh to taste the "Law". Yeah, my sympathy for these brave army and civilian officers who did their part in exposing vital secrets. However, here is my say, "DO SOMETHING EFFECTIVE and MOMENTOUS or NOTHING AT ALL". bi Laden hit New York, Pentagon and tentatively the White House. That's worth it in any case. The officers should have 'taken out' Than Shwe, Maung Aye, Shwe Mann or the lot as a whole in the first place since they had the opportunity, proximity and time on their hands and at their disposal. He can 'CORK' a million bottles but could not keep mouths, eyes or ears of people 'CLOSED', lest Than Shwe forgets. Keeping secrets would serve none for Than Shwe in this day and age of TRANSPARENCY and IT technology, a universal belief and as practiced today. Shameful, disgraceful and impunity. The Electronic Act and holding foreign currencies are just a magic law which can put anybody and anyone in Burma to the jail. In Burma holding even one cent $ is punishable to 20 Years prison term. Nowadays, the people are required permits [for everything] and must hold about 5000 US$ at any time at anywhere on earth. We Burmese must bury those stone age acts which are shameful and disgraceful. Well, if you tell the truth about Than Shwe and about his crookedness, you are going to get killed. Even invalid laws can be brought back to make you quilty and executed by Than Shwe. This kind of dirty job is what he can do best. He himself is going to Hell anyway for eternity. Why are Human Rights Watch, Amnesty International, Burma Campaign UK/US, NLD, and other opposition groups so quiet about this impending execution? Why have they not condemned this execution? They are not denouncing the fact that two brave SPDC officials who are willing to give up their lives to expose their masters' crimes. Opposition groups have to work together and support brave SPDC officials like those two who want to rebel against their evil masters. It was very sad for these three. I hope their bravevy and strength will not be forgotten. It shows their dishonesty: how mad they are at them. Are these Junta thugs living in cage or in stone age or in animal kingdom? Maybe all of them. What are they so afraid of? Only the guilty are afraid of others finding out what they are up to and only the cowards take such a drastic measure as giving death sentence for such a crime. It's terrible that no one would help those given such inhumane sentences. Obviously they are agents of change and deserve recognition. The thugs are giving a strong message of terror and unfortunately it might work.